This hacked-up 2002 Chevy Blazer (5-speed!) is for sale on Craigslist in Ohio. It’s been converted to a pickup, there’s a porthole window on the giant B-pillar, and the front end has a ‘50s sedan look to it. 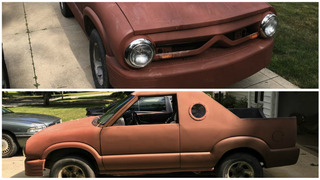 Top it off with chocolate brown paint, and you’ve got a very “special” vehicle—and all for only $900!